Skelit's Revenge. The most feared ship on the high seas... you've finally overtaken it. Captain Fromm and his skeleton crew have amassed a massive treasure, and now is your chance to board and plunder it all! 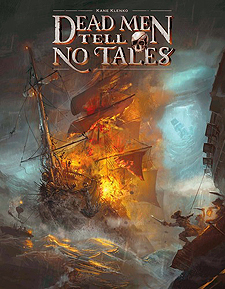 Dead Men Tell No Tales is a cooperative game where players take on the role of a pirate crew, boarding Skelit's Revenge for one purpose: treasure. Battle the crew, the raging inferno, and your own fatigue as you fight to stay alive. Do you and your crew have what it takes to make off with the loot and live to tell the story. Or are you going down with the ship, in Dead Men Tell No Tales?